So, we’re on the tail end of zucchini and tomato season and it’s time to get down to business and talk about Zucchini Noodles with Roasted Tomatoes. My mom called a few days ago (again) and told me she had picked 7 GIANT zucchinis that day. What? How does that happen? She has a serious green thumb and I’m here like, why did my rosemary and mint just shrivel up and die? And those are 2 herbs that are supposed to stay alive no matter what!?! I’m a plant killer. One day I’ll learn that plants actually need water and when I leave town for days on end, they aren’t going to water themselves. But today’s not that day, and I’m leaving the “green-thumbing” in our family up to my mom. I’ll just go visit her and raid the garden and pretend that I’m eating the rewards from all of my hard gardening labor. Anyways…… zucchini. It’s going crazy And I’m literally devestated that tomato season is almost over. So today I’ve got the perfect recipe to use up the last of it before it goes away for the season. Zucchini Noodles. Boom. With blistered tomatoes and grated cheese. Hello? Yes please. I live by handy dandy little spiralizer these days and I’m not sorry about it! Ever have those nights that you just need to eat something light yet filling because you have to squeeze into a dress the next day or you just want to give you body a bit of a break. Ladies, I know you feel my pain. Guys, I know that totally happens to you all the time. Getting dressed in the morning is tough work and we all just wanna look good. Am I right? This is the answer. 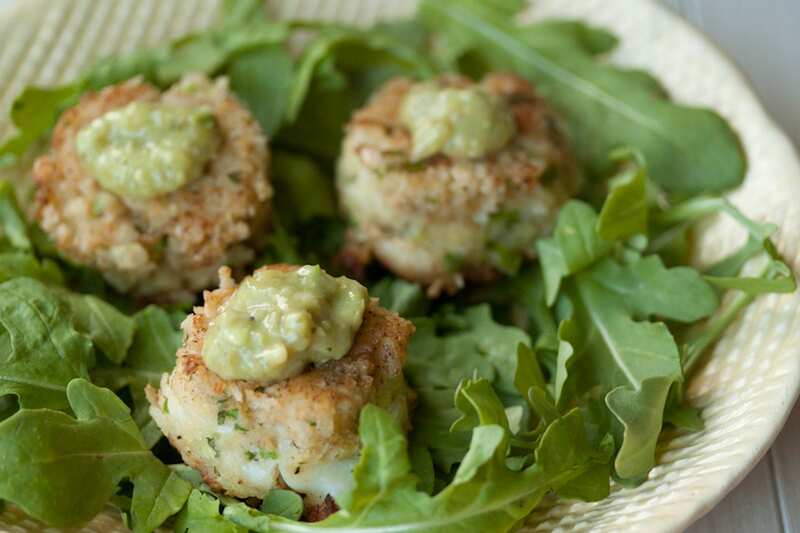 It’s a quick and simple lunch or dinner that is going to rock your world. 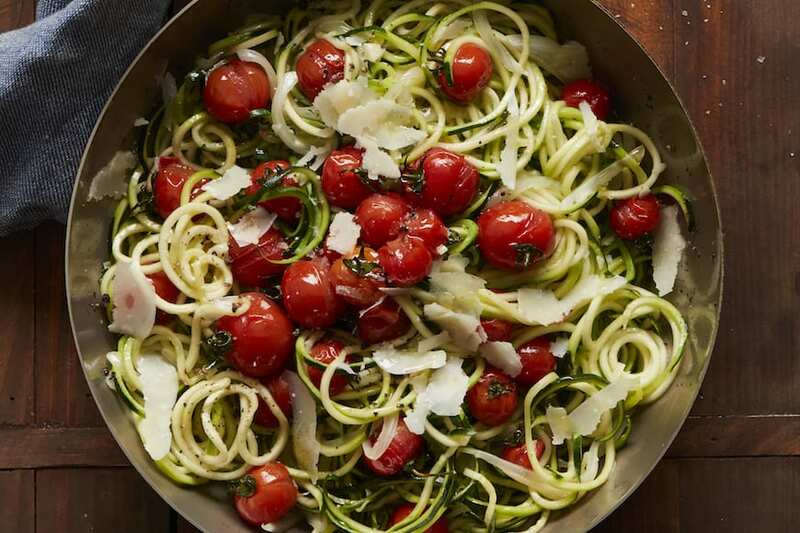 Zucchini Noodles with Roasted Tomatoes. This crazy addictive Zucchini Noodles with Roasted Tomatoes dish is made up of lightly sautéed zucchini noodles that are with some finely cut onions and garlic, topped with roasted cherry tomatoes that have been in the oven long enough to just barely burst open, and a sprinkle of Pecorino cheese. To.Die.For. Distribute the cherry tomatoes evenly on a baking sheet. Drizzle with 2 tablespoons of olive oil and season with salt and pepper. Transfer the baking sheet into the oven and roast for 10-15 minutes until the cherry tomatoes just start to burst. Remove the baking sheet and set aside. Using a spiralizer, spiralize the zucchini into noodles. Heat a large nonstick skillet over medium heat. When hot add 2 tablespoons of the olive oil, onions and garlic and cook until fragrant, about 1 to 2 minutes. Add the zucchini noodles to the onion and garlic mixture and sauté for 1-2 minutes. 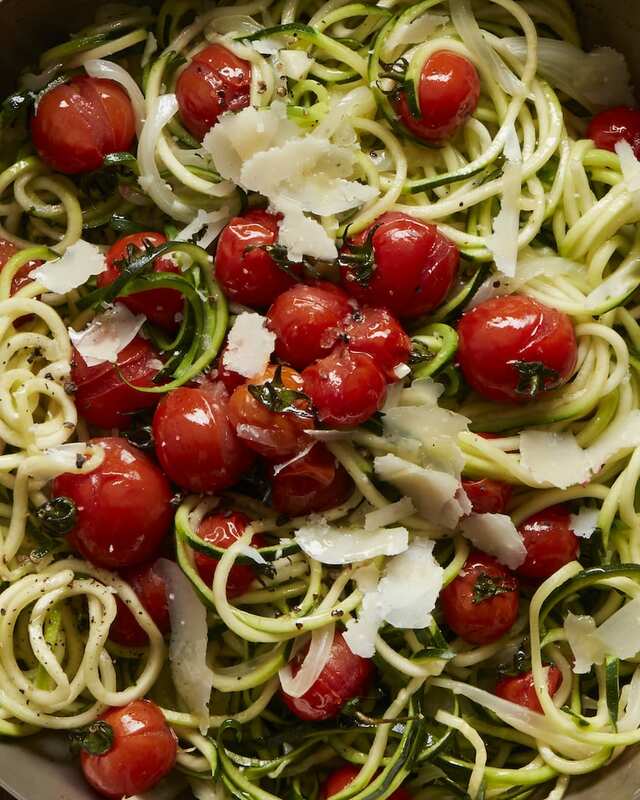 Remove from the heat, add the cherry tomatoes to the zucchini noodles and season with salt and pepper. Toss to combine. Dust the top of the noodles with the shaved cheese and serve. Sounds a great recipe for my fast days, when I’m limited to 500 calories for the whole day. totally!! I use it all the time when I’m trying to keep my eating light! Just made it – yummy! Just made it – yummy! Now trying hard to restrain myself and not eat the portion I’ve set aside for my hub… Can’t wait for my julienne cutter to arrive from Amazon so I can cut better noodles! I just happen to have a ton of cherry tomatoes and I love zuke noodles! Perfect reminder to make them! I love zuc and this sounds promising. My problem is with the cheese. I am not familiar with nor have I seen either. I generally skip recipes where this happens without a note but would like to try this one. What is a similar, more common cheese? You could use Parmesan cheese as a replacement! Now I need one of those spiral things. This salad looks beautiful. it’s going to rock your world! I’ve been “spiralizing” since last week NON-STOP! I have never heard of a spiralizer but I am going to go and look for one today, so I can continue to enjoy my zucchini! This looks light and beautiful and just perfect. 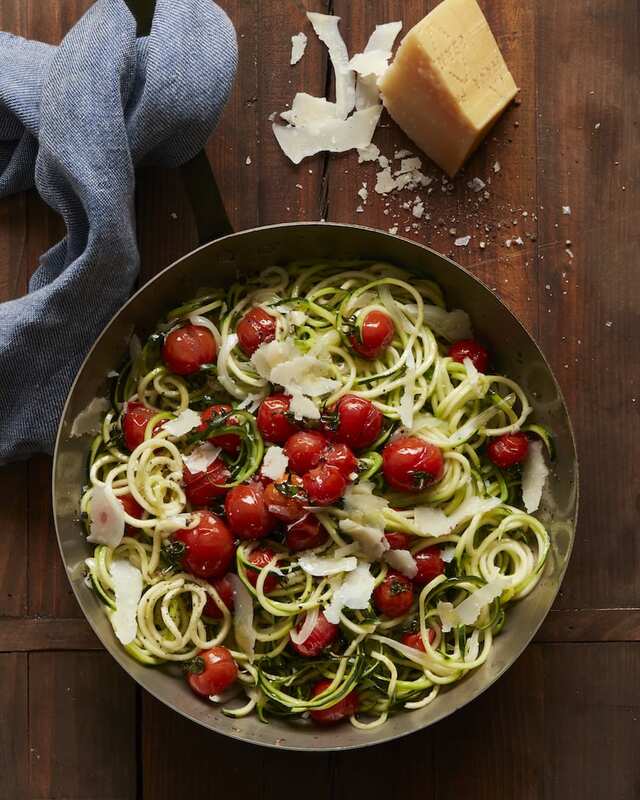 Simple and summery, with heaps of tomatoes and cheese… just how I like my zucchini noodles! This is a big bowl o’ love, Gaby! This is such a perfect (and beautiful!) meal, Gaby. I could eat those roasted tomatoes for daaaaaays! Ditto!! I’m crying just thinking of the summer tomatoes going away! Looks so fresh and yummy! Looks like lunch to me. Love those colours, Gaby! hahahahah YES!! Plant killers for life! Could gobble this whole thing up! Looks delicious! I did! It’s totally allowed! This is so pretty! And blistered tomatoes sign me up! PS I’m jealous of your mom’s green thumb because, I am in Seattle too and when I planted zucchini last year I got one. ONE. O.N.E. AND to top it off the squirrels got to it before I could pick it. 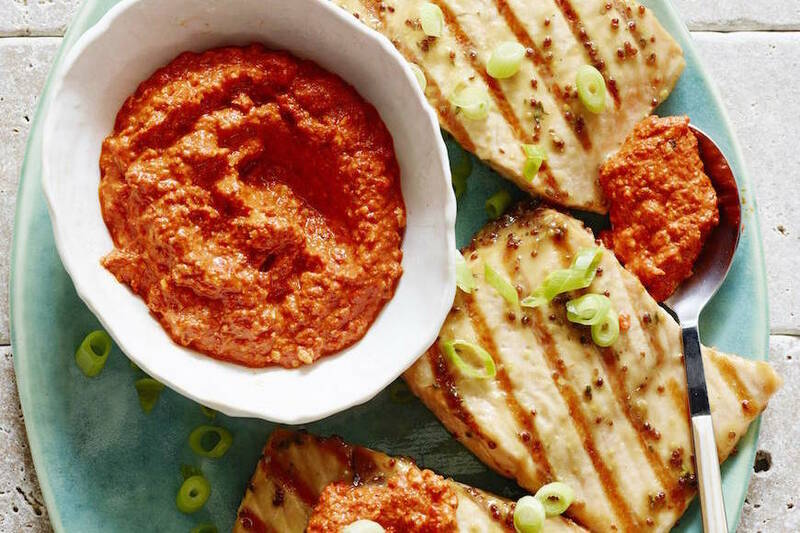 Love this, especially the roasted tomatoes! 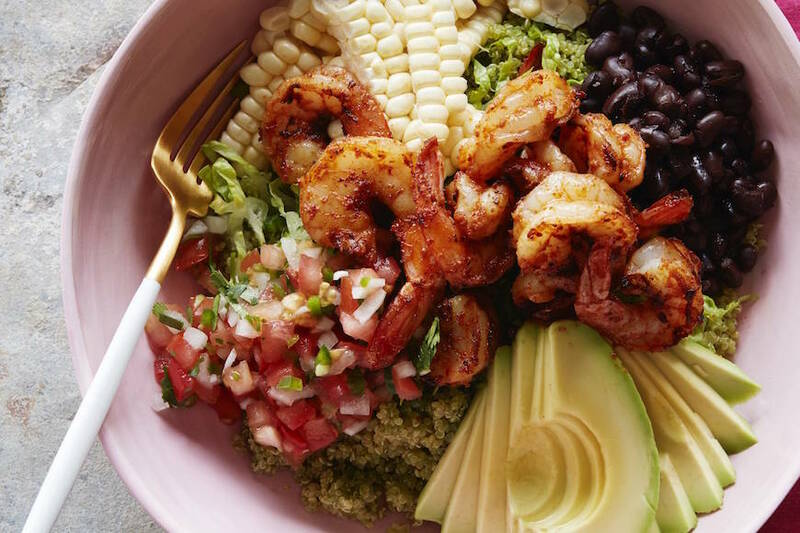 This looks really delicious and healthy! I’m going to try it but I have a gadget that is soooo easy to use and is cheaper than a spiralizer. Makes “julienneing” easy. Check out the Zyliss Julienne Peeler on Amazon. About $8 or $9!! I am a big, big fan of this one. So simple; so elegant! The second i get home I am making these. I love that zucchini can look so incredibly tempting!! Go steal some zucchinis from my moms garden!! Looks delicious, Gaby! 🙂 Perfect late-summer meal! Love the cherry tomatoes! Looks super fresh and delicious! Love that you’re giving zucchini noodles the spotlight here! What a simple yet yummy dish. Great post! I love your post…We have the same taste. I love to buy kitchen tools like your Spiralizer but what I bought was the Procizion Vegetable Spiral Slicer at the Amazon . First time I use it, it was amazing…Good thing I bought one – now I’m hassle free when I cook. I am a zucchini lover, and since being turned on to the spiralizer by you, we love, love, love these noodles!